Gov. Jerry Brown holds a copy of a bill to end bail he signed Tuesday, Aug. 28, in Sacramento, Calif. The bill, co-authored by state Sen. Bob Hertzberg, D-Van Nuys, third from right, and Assemblyman Rob Bonta, D-Alameda, right, makes California the first state to eliminate bail for suspects awaiting trial. It goes into effect in October 2019. 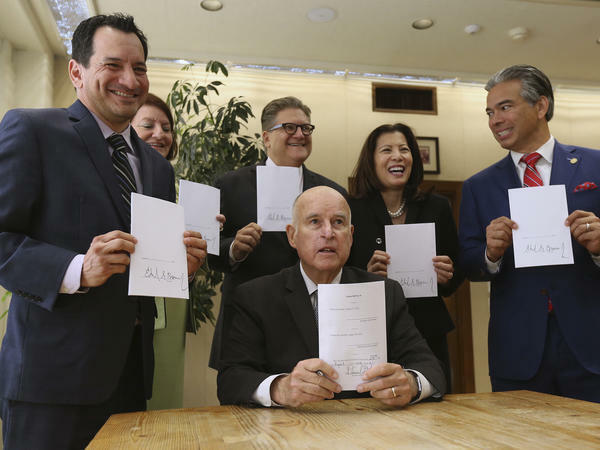 "Today, California reforms its bail system so that rich and poor alike are treated fairly," Brown said in a statement, moments after signing the California Money Bail Reform Act. The governor has waited nearly four decades to revamp the state's cash bail system. In his 1979 State of the State Address, Brown argued the existing process was biased, favoring the wealthy who can afford to pay for their freedom, and penalizing the poor, who often are forced to remain in custody. "Our path to a more just criminal justice system is not complete, but today it made a transformational shift away from valuing private wealth and toward protecting public safety," Sen. Robert Herzberg, a co-author of the bill, said in a statement. "California will continue to lead the way toward a safer and more equitable system." Washington, D.C., already has a cashless bail system. Other states, including New Jersey, have passed laws that reduce their reliance on money bail. And other states are considering making similar changes. Under the California law those arrested and charged with a crime won't be putting up money or borrowing it from a bail bond agent to obtain their release. Instead, local courts will decide who to keep in custody and whom to release while they await trial. Those decisions will be based on an algorithm created by the courts in each jurisdiction. Meanwhile, the American Civil Liberties Union of California, an original co-sponsor of the bill, pulled its support, arguing that last-minute changes give judges too much discretion in determining under what circumstances people will be released or kept in custody. Raj Jayadev, co-founder of advocacy organization Silicon Valley De-Bug, said like the ACLU, his group is a former supporter of the bill. Ultimately, as it is written, he told the Sacramento Bee, the law discriminates against the poor. "They took our rallying cry of ending money bail and used it against us to further threaten and criminalize and jail our loved ones." And there's the end to the state's bail bond industry. "We're gone. We're done. As of today the bail industry will start shuttering their doors," Topo Padilla, President of the Golden State Bail Agents Association told NPR. The Wall Street Journal reports that that could affect 7,000 jobs, though Jeff Clayton, president of the American Bail Coalition, told NPR station KQED that it's likely that the bail industry will sue, putting the law on hold. Padilla contended the law is bad for the people of California. The law "straps the taxpayers with funding 100 percent of all pretrial release programs," and will lead to increasing detentions of people who otherwise would post bail, he said.